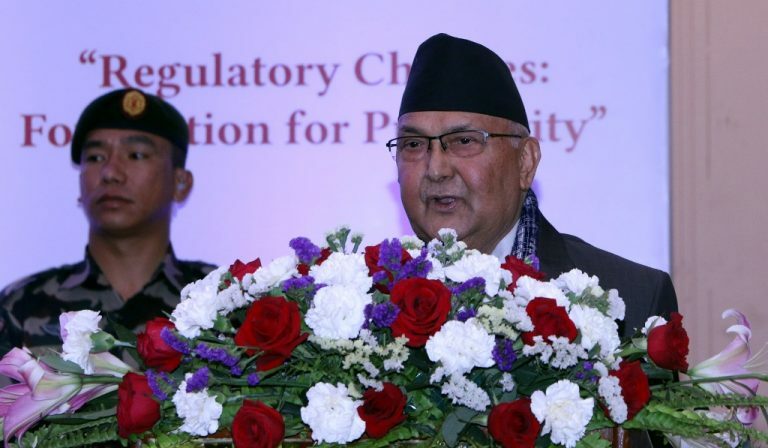 KATHMANDU, April 8: Prime Minister KP Sharma Oli has said that a policy has been adopted for moving ahead forging partnership with private sector for industrial progress of the country. Inaugurating the 16th annual general meeting of the Confederation of Nepalese Industries (CNI) on Monday, Prime Minister Oli said that the government would always help the private sector for import substitution and promoting export. “The government will play role of facilitator in formulating required acts, laws and rules, and in building physical infrastructure for the economic development of the country. So, the investors are encouraged to invest in industrial sector in a transparent manner,” he said stressing on the need to discourage fake transaction, sale of fake VAT bill and non-transparent activities. Saying the government was determined to encourage and protect domestic industries, the Prime Minister urged not to carry out illegal activities. He expressed commitment to support the private sector in the technology, raw materials and machines, saying politicians, industrialists, entrepreneurs and bureaucracy should now play leadership role. PM Oli stated that all classes of the society should be active towards the path of progress by resolving the problems for national welfare and economy as environment conducive for industrial and economic activities was building. “Increase in productivity, employment, strong economy and self-dependent on it is our goal”, he added. On the occasion, the Prime Minister honoured the DHL Express, the Reliance Spinning Mills and the Jagadamba Spinning Mills in recognition of their contribution to the export promotions. Likewise, Balkrishna Shrestha, Shiva Ratan Sharada, Pawan Golyan, Bijaya Shah and CNI former chair Narendra Basnet were awarded the ‘CNI President Honour’. The Prime Minister also on the occasion launched a collection of feedback relating to the Infrastructure Conference organised by the CNI this year. Finance Minister Dr Yuba Raj Khatiwada said the government was committed to materialising the dream of a prosperous Nepal and the partnership with private sector was in the government priority to advance towards that end.